Geoff in his beautiful silk shirt. Photo by Johan Anglemark. Established in 1968, the Clarion Writers’ Workshop is the oldest workshop of its kind and is widely recognized as a premier proving and training ground for aspiring writers of fantasy and science fiction. As we do each summer, MGSD will be hosting the visiting instructors at our store. 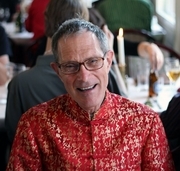 Geoff Ryman is a writer of science fiction, fantasy and surrealistic or "slipstream” fiction who currently lectures at the University of Manchester in England. He is best known for his science fiction; however, his first novel was the fantasy The Warrior Who Carried Life, and his revisionist fantasy, Was, has been called "his most accomplished work". Geoff Ryman discusses his works. Geoff Ryman is currently considered a "single author." If one or more works are by a distinct, homonymous authors, go ahead and split the author. Geoff Ryman is composed of 5 names. You can examine and separate out names.